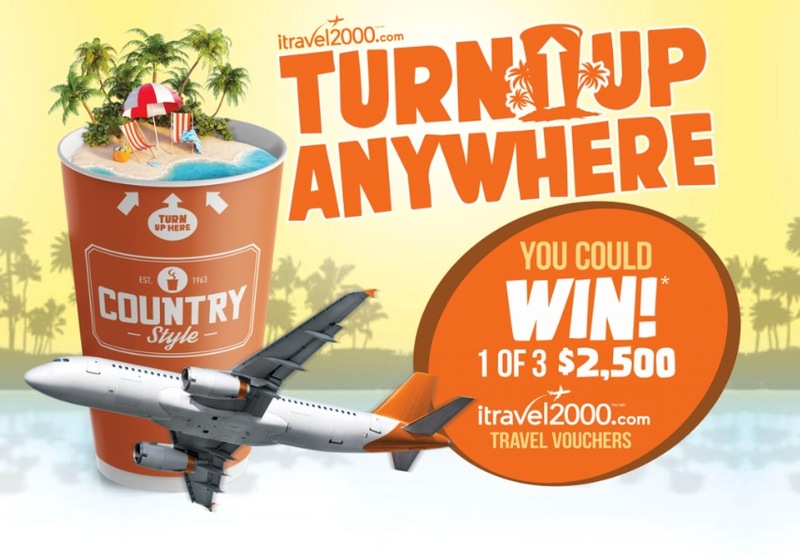 Enter the Country Style Turn Up Anywhere Contest 2019 for your chance to Win 1 of 3 $2500 travel vouchers and more. This contest is open only to legal residents of Ontario, New Brunswick, Nova Scotia, Newfoundland, Prince Edward Island, British Columbia, Saskatchewan and Alberta who have reached the age of majority in their province of residence. To enter you need to visit any participating Country Style location and buy a medium, large or x-large hot beverage, then roll up the lid to discover wether you won or not. This contest closes on Sunday, April 7, 2019. Winners will be selected and notified instantly upon rolling up the lid of the cup. There are three Grand Prizes available to be won, each consists of a $2,500 Travel Voucher. There are also ten $100 pre-paid credit cards, one hundred $50 gas coupons, fifty $50 Country Style gift certificates and thousands of coffee, doughnuts and cookies. The Country Style Turn Up Anywhere Contest 2019 begins on February 18, 2019 and ends on April 7, 2019. Winners will be selected and notified instantly upon rolling up the lid of the cup.